Swivel seat rotates 360 degrees in both directions providing freedom of movement within the shower. Conveniently sized to fit into small spaces. Non-slip feet hold it securely in place. Easy to assemble; no tools required. Height adjustable legs 16-21. Seat diameter 16. Supports up to 300lbs.This is a Special Order item and cannot be cancelled or returned (unless defective). 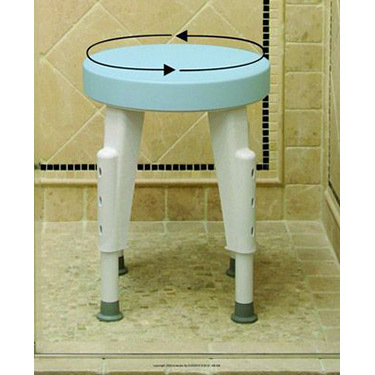 My 82 yr. old husband has two artificial and Parkinson's disease and this stool works well for him in the shower. He has balance problems and a loose hip joint and standing and turning was very very risky. My husband is very pleased with this stool. Loves the freedom it gives him to take long showers.